The Telefunken Magnetophon 15A, or M15A for short, is one of the world's finest master recorders for professional audio use. 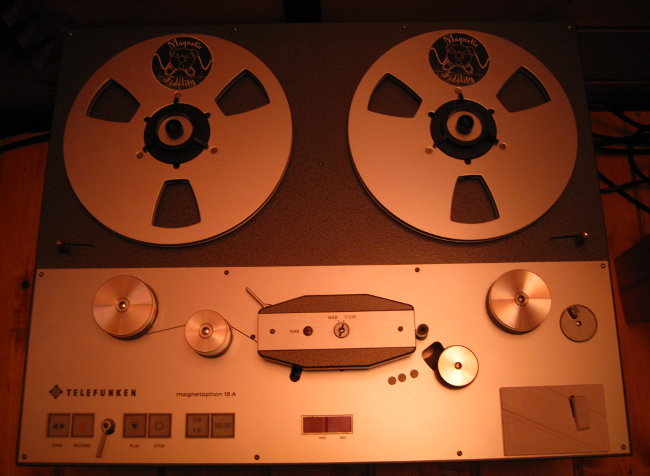 These were built by AEG/Telefunken in Western Germany from the early 70's to the early 90's. The M15A offers the finest tape transport system ever built, with a lower W&F than any other analog reel-to-reel tape machine. Everything on it is overengineered and the motors can also be used to drive a truck. They are a dream to adjust and calibrate as long as you are the kind, who likes screwdrivers. It comes with all the necessary functions and nothing that will remain unused. It is a completely modular construction, that can be repaired or reconfigured in the field. The only problem is that you can't lift it!!! The machine itself without any cover, case or console weights in at around 100 lbs. The Telefunken M15A machines in our mastering studio have been completely refurbished and modified to our specifications by a veteran service engineer, who used to work for Telefunken, when they were still making these. He installed switchable NAB/CCIR equalisation cards and headblocks on both our machines as well as autolocator cards. He also installed brand new Studer butterfly heads on both machines. These heads sound astonishingly good and you will not find them on any Studer machine, because they were a special order of our service engineer to Studer, built to exact specifications to act as suitable replacements for the long discontinued line of Telefunken heads. Our machines also come with flying start recording, a unique feature of the Telefunken M15A, which enables complicated editing to be easily performed on tape. The recording and playback amplifier cards have been specially calibrated to enable the recording and playback of really hot tapes, massively increasing the available headroom to levels much higher than any other machine. These machines are very gentle with tape and they even have an adjustable winding speed, so you can slow wind tapes to avoid putting any strain on them. They even come with a capstan motor running hour meter to remind you of maintenance needs. These machines have a capstan motor that stops running when there is no tape loaded, so they can be left powered on 24/7 just like all the rest of our equipment to keep the electronics stable.